October 19; At the completion of the second year of the current Parliament and Provincial Assemblies, 66% of the respondents approve of the Overall Quality of Democracy in Pakistan. 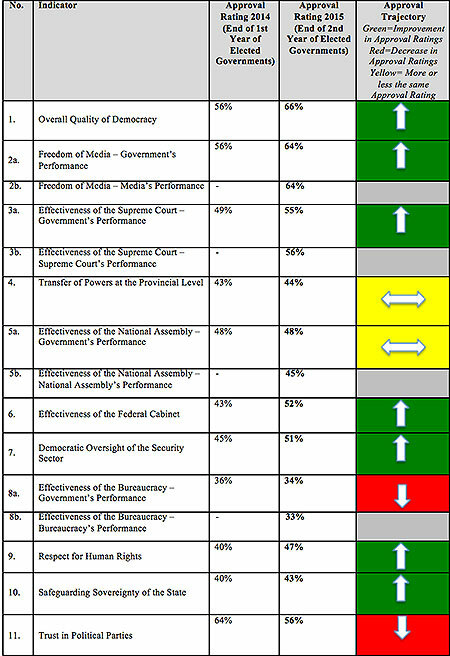 On 11 core indicators measuring quality of democracy in Pakistan, 6 show positive approval rating while 5 are rated negatively. 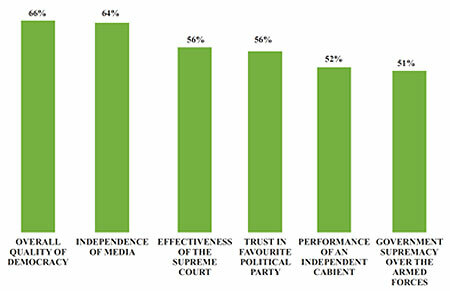 Respondents have given above 50% approval rating to Independence of Media (64%), Effectiveness of Supreme Court (56%), Trust in Favourite Political Party (56%), Performance of Independent Cabinet (52%), and Democratic Oversight of Security Sector (51%). 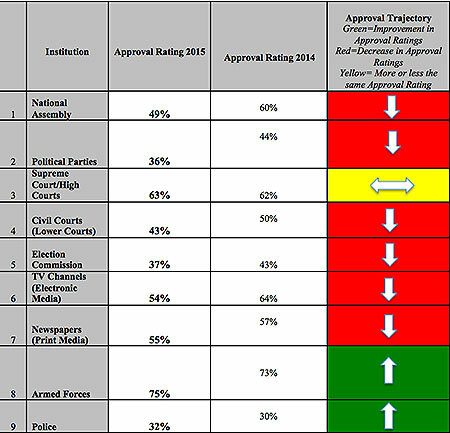 Approval Ratings for these 11 core democracy indicators for both the surveys conducted at the end of the 1st and 2nd year of the Government can be seen in Table 1. 59% of the respondents believe that the General Election in 2013 was somewhat to completely transparent and fair. On the contrast 30% respondents see the Election as somewhat to completely rigged. For the democracy survey conducted at the end of the 1st year of the elected Governments, 53% of the respondents believed that General Election 2013 were completely to somewhat transparent and fair and 37% thought they were somewhat to completely rigged. Signifying decreasing support with Pakistan’s political parties, 56% of the respondents stated that they retain ‘Very High’ to ‘High’ level of trust in their favourite political party at the end of the 2nd year, in comparison to 64% at the end of the 1st year. Additionally, the Approval Rating for trust in political parties as an institution remained low, with only 36% of the respondents expressing their approval for it. The Pakistan Muslim League-Nawaz (PML-N) had the highest approval amongst the population, with 70% of the respondents rating the party’s competence highly. The Pakistan Tehreek-e-Insaf (PTI) followed at an Approval Rating of 44% The Jamaat-e-Islami (JI) and the Pakistan Peoples Party were approved of by 40% and 36% of the respondents respectively. In contrast, all other political parties included in this poll generated relatively lower approval levels of their competence. The MQM emerged as the most negatively rated political party in the country with an Approval Rating 14%. Dr. Tahir-ul-Qadri’s Pakistan Awami Tehreek (PAT) received a relatively low rating at 19%, the Awami National Party (ANP) was favourably voted for by 21% and the Jamiat Ulema-e-Islam Fazl-ur-Rehman (JUI-F) had only slightly higher Approval Ratings at 23%. A review of the current leadership of the country shows that the people of Pakistan have contrasting views on the most trustworthy leaders in the country. Of the political leadership in the country, Prime Minister Nawaz Sharif emerged as the most popular political leader with an approval rating of 75%. Mr. Muhammad Shahbaz Sharif, the Chief Minister of the Punjab is not far behind at an Approval Rating of 72%. Mr. Imran Khan, Chairman PTI, has garnered an approval of 49%. Other national political leaders that the poll included had relatively lower ratings. Mr. Altaf Hussain emerged as the least popular leader in Pakistan with an approval rating of 13%. Chaudhry Shujaat Hussain also earned substantially lower ratings at 19 %, followed closely by Mr. Asfandyar Wali at 18%. Mr. Asif Zardari, Co-Chairman of the PPP earned a similarly weak Approval Rating of 27%. A comparison of Approval Ratings of national leaders, for the survey conducted at the end of the 1st and 2nd year of the current elected Governments is given in Figure 4. Respondents from across Pakistan were also asked to assert their level of approval in terms of how democratic major national institutions were. The data presented in Table 2 provides an indication of the most and least trusted institutions in the country, along with providing a comparison of Approval Ratings for the survey conducted at the end of the 1st and 2nd year of the current elected Governments. Pakistan’s Armed Forces are seen as the most trustworthy institution, with an approval rating of 75%. In comparison, this Approval Rating stood at 73% by the end of the 1st year.